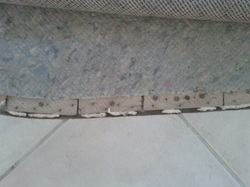 Carpet attachments are performed where carpet meets other types of flooring (tile, hardwood, sheet vinyl, etc.). They are required when new hard surface flooring is installed, when carpet is pulled up for some reason, or when the orginal installation fails. The existing tack strip is inspected, new is provided as necessary, or a metal / wood transition strip is installed, a bead of adhesive is applied to mitigate unraveling / fraying, and then the carpet is stretched and secured to the edge of the new flooring.